Seeing Road was my first ever trip to the Royal Court and it was a real eye-opener. Not only was the production fantastic, so was the venue itself. With a youthful and vibrant energy about it, it felt like a great place to be. First shown at the Royal Court 30 years ago, Jim Cartwright's Road shows us the lives of several people living on an unnamed road in the north of England in 1986. Through a series of vignettes, and led by our drunken guide Scullery (played by Lemn Sissay) we discover the predicaments of the various inhabitants in a time of high unemployment and social hardship. Cartwright depicts perfectly the daily struggles of these people through his gritty and direct text. The more intimate scenes take place in a large box in the middle of the stage which rises and falls throughout the play. In there, the characters are like caged animals and we observe, almost intrusively, through a one-way mirror. Each scene is extraordinarily powerful. Liz White is heart breaking as she plays Valerie, a young woman awaiting the return of her constantly intoxicated husband. Earlier on, old Molly bumbles around her house getting ready to go out, eking out an existence (this is played magnificently by June Watson). Mark Hadfield delivered a poignant monologue as Jerry, an ex RAF officer, lamenting the backwards progression of life. Joey and Clare lie in bed, Joey on a 'diet'. In his darkest hour he is desperately searching for some form of enlightenment and is convinced that through fasting he will find something to lift him from the depth of his despair. Clare, his girlfriend, joins him seemingly out of boredom, but also to show her love and devotion towards Joey. The acting in this scene is breathtaking. Faye Marsay and Shane Zaza are outstanding. Throughout the play there is not a single faulty performance, I'd say without hesitation that this is one of the strongest casts I have ever seen. 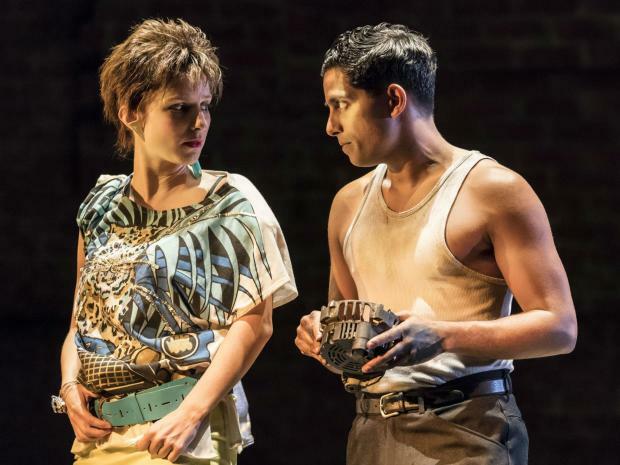 Through the combination of this production's marvellous acting, sound design, lighting, set and costume (not to mention the script) it is not difficult to be transported to the mid 80s, and it is easy to believe that we are watching real people on a real road. A wonderful piece of theatre has been created here and I will definitely be calling again at The Royal Court. There are excellent seats available for £12 in the balcony, with no obvious restrictions for this particular production, and Under 26s can sit in certain places for £15.